It wasn’t until this past year that I actually became a fan of dried flowers. I can’t believe it took me so long to discover their benefits. Until recently, I had always turned my nose up at dried flowers because they reminded me of tacky, dated flower books from the late 80’s. One of the best parts about drying flowers is that you can preserve the abundance from your garden to be enjoyed later in the year when nothing is blooming. This winter when we were finishing the winter chapter of the flower arranging book and found ourselves scraping for material. Dried flowers saved the day. I can’t believe I just typed those words! Technically you can dry just about anything and there are dozens of books on the subject lining the shelves of nearly every used book store and thrift store. I recently discovered an awesome, albeit dated, book called Flowers: Growing-Drying-Preserving by Alan Cormack and David Carter that goes into great detail on all the different varieties that you can dry, plus step by step instructions for how to do it utilizing both air drying and silica gel. 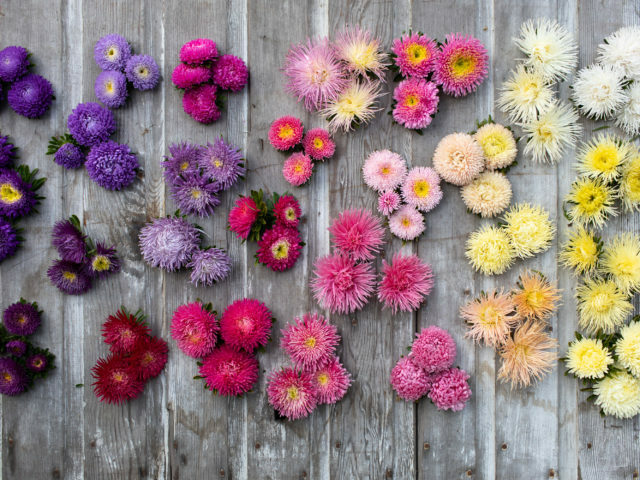 This season we focused on just a few main ingredients, including pods, ornamental grasses, plus statice and strawflowers in every color of the rainbow. The seed pods came in handy for late autumn arrangements and the strawflowers actually looked incredible when mixed with fresh blooms. When it came to drying, we kept things easy and simply hung the harvested bunches upside down in the back of the garage where it gets really hot and dry in the summer. Common advice is to dry flowers in a warm, dark place, but thankfully ours dried so quickly that their color didn’t fade in the sunlight. After the bunches were completely dry, we wrapped them in pieces of kraft paper and stored them in plastic Rubbermaid bins until we were ready to use them. I mailed two huge boxes of dried goodies to my friend Nina in Vermont who makes the sweetest little dried wreaths that she sells at craft fairs in New England. I divided the rest among the team and the ladies are still having fun crafting with them. What got me going on the dried flower bandwagon in the first place was my flower friend Siri Thorson. 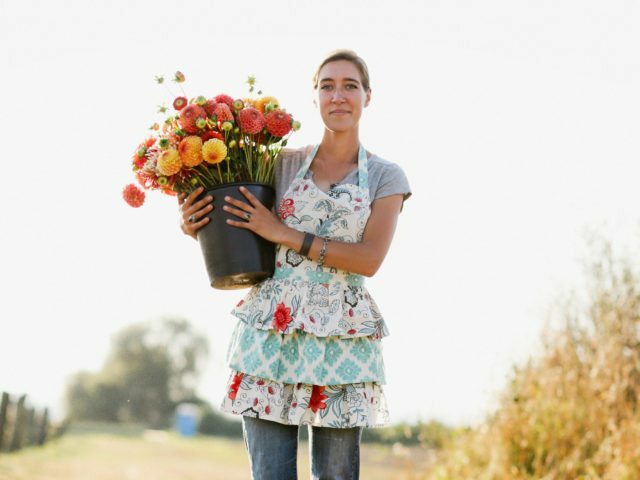 Siri lives on one of the most remote San Juan islands and travels between her family’s farm and destinations worldwide arranging flowers. 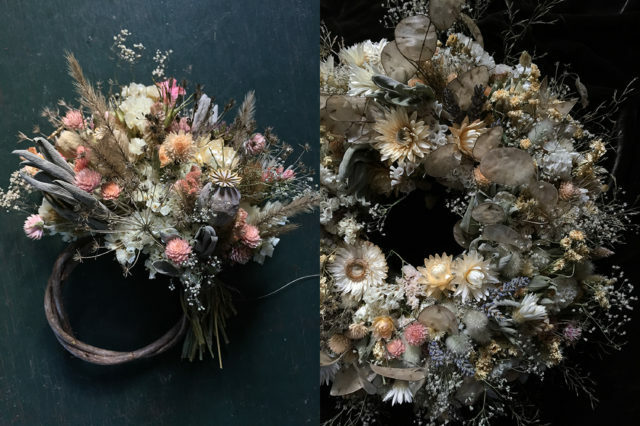 Siri makes the most stunning works of art from dried flowers that she grows on her family’s farm and ships them nationwide around the holidays. Pictured are some of Siri’s incredible everlasting wreaths. Aren’t they amazing? I am determined to learn her secrets in the near future. She’s hinted at teaching a few workshops next fall and I’m planning to be the first person to sign up. While I have grand plans of expanding what we grow and dry next season, I still have a lot to learn. Some of the varieties I’d like to focus on are celosia, globe amaranth, lunaria, love-in-a mist, statice, strawflower, hydrangea, poppy pods, larkspur and ornamental grasses. 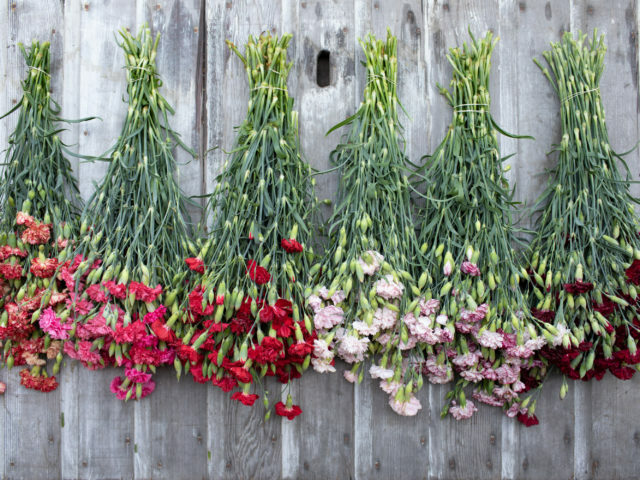 Flowers for drying should be picked more open than you would for fresh cuts, but make sure they’re not too ripe. I would suggest picking blooms when they are about three-quarters of the way open. If overly ripe, they will fall apart during the drying process. After flowers are harvested, you’ll want to remove all of the foliage and leaves on the stem because they will turn brown and funky when they dry. I skipped this step on about half of our dryables and I regretted it later because they looked dead and cruddy. Be sure to hang your bunches upside down while they are drying because the flower heads will be fixed in whatever position they were in when they dried. Hanging them upside down will ensure straight, usable stems. Handle dried flowers with care because they are quite fragile and can break easily. If you aren’t going to use them right away, you can wrap them in tissue or kraft paper and store them away until needed. I’d love to hear what you think about dried flowers. Are you adding any to your cutting garden this season or do you think they are tacky and dated? If you’re a dried flower fan, I’d love to know your favorite varieties for drying and any resources that you’d recommend for beginners. My favorite flowers to dry are zinnias. They retain their color so amazingly using silica sand as the drying agent. Strawflowers are my second favorite but timing is everything as I don’t like when you can see the center, that is when you waited too long to harvest. Sweet annie is another favorite but I “dry” it in glycerin and it keeps its wonderful scent and remains soft as though cut fresh from the garden. I love dried flowers and try to dry at least some nigella pods, strawflowers, poppy pods and statice every year. I tried drying some red spike amaranth last fall, but it faded a lot (and dropped a ton of seed all over the place). A friend of mine dries zinnias and dahlias and they surprisingly keep their color and look great. I don’t think their tacky at all and bring cheer in winter when not much is blooming. Thanks for all your posts of information, and inspiration! Even if you did nothing but leave them hanging in the shop it would be amazing. They are gorgeous! I dried larkspur last summer, and was amazed at how well they dried. Hung them in the dry storage shed and they did well. This year I’ve added gomphera (sp? ), and celosia, neither of which I’ve grown before. Saw very lovely wreaths at the Full Belly Farm farmers market stand last fall – concentric layers of small to large flowers – really stunning. I have mixed results with hydrangeas and will watch this space for advice. Lace cap not conducive to drying? Mop heads seem to vary, some dry, some don’t. Thanks for this post. It amuses me that dried flowers are becoming popular again as I used to sell tons of them, as well as dried wreathes and arrangements. Now all of a sudden they are cool again! Besides stretching out the selling season and using flowers that didn’t sell when they were fresh, they are so beautiful and last for- well, until they get too dusty and faded- which is quite awhile. Some of my favorites were roses and larkspur, but there isn’t much that doesn’t dry well. I used silica to dry pansies, sunflowers, zinnias- all the things that have a flat face -more time intensive, but they add so much personality. Hanging bunches of lots of herbs like mint, oregano, lavender,dusty miller, lambs ears, etc. make lovely filler in addition to the grasses and pods you mentioned. You are going to have some fun ahead! I made a few dried arrangements last fall for a bakery/cafe I sell my flowers to, and I was surprised by the response they got. The owner told me everyone was taking pictures of themselves with the arrangements and ooh-ing and ahh-ing over them. I was shocked! The dried arrangements were also a great solution for this business, which is always hot (thank you, bread-baking ovens) and has lots of south-facing windows. The fresh flowers baked in there and only lasted a few days at most, but my dried arrangements lasted all winter until I had fresh blooms to replace them with. I had similar thoughts to yours regarding dried flowers – tacky 80s crafts – but these arrangements turned out so beautifully that I was already planning to grow more varieties that could be easily dried. Your post was timed perfectly! I’m wondering how to dry my flowers well in hot, sticky, Michigan weather, though. We don’t have the dry summers that you do out west. Any thoughts? I dry Hydrangeas every year for winter color in my home. I wait until about the 3rd week in September (in our area of southern B.C.) to cut them and dry them in a vase (with a small amount of water in the bottom), that way they don’t dry all wilted looking if you do them upside down. I’ve also learned from experience to cut the stems as long as you can, so you have the option of different sized containers to display them in, or like me have to add length to them with florist wire/sticks, which works, but not always ideal. Happy drying! Hydrangeas are my favorite flower to dry. I just let mine dry right on the bush in the fall and then cut them off. Lavender and ornamental oregano are also a favorite for drying, along with eucalyptus (though I can get that from the store). Seeded eucalyptus and long leaf eucalyptus dry so nicely. This year I stumbled upon dries zinnias working well as well, when I went to dry them for seeds. Love this article and that dried flowers are seeing their day. As a buyer and retail shop owner/interior designer I’ve been keenly watching this lovely trend sneaking it’s way back into decor the last few years. Honestly, I felt like you did at first…”oh no…not the tacky 80’s thing again!” Frankly I found myself wondering when the Precious Moments figurines might start popping up in my Pinterest feed! Yikes! LOL! But now, I’m actually finding myself growing flowers specifically for drying purposes! I love how designers are using pampas grasses in wedding photo backdrops and I continue to see dried arrangements/wreaths etc…finding their way into the prettiest of wholesale showrooms at the various markets I attend. Personally…I’ve been growing globe thistle and hydrangeas for years and just began drying them again this past fall. This Spring I’m introducing bread seed poppies, sea holly, bunny tail grass, strawflower, love-in-a-mist, yarrow, celosia, silver dollar/money plant, scabiosa sternkugel, Chinese lanterns and craspedia from seeds (some purchased from you). I am also growing many herbs for drying to make my own tea. Chamomile, lavender, calendula and marshmallow to name a few. I hope I have enough rafters to hang them all from this summer/fall! I look forward to seeing what you’ll be doing with all your lovely dried flowers…I’m so happy to know I am not alone on the dried flower front! I have been experimenting with drying different kinds of cut flowers in our small, dark basement where we always have a dehumidifier running during the summer months. One flower that surprisingly dries well is sweet peas. The vines and pods dry well also. They are nice for swags and garlands. Also try drying peonies! They shrink in size, but make a lovely little flowers with very sturdy stems. New to flower farming and love the drieds! Your topics are always so ‘on point’…thanks for another great post! So happy to have statis, globe amaranth, and strawflower hanging at home this winter! Pearly Everlasting is another special wild find I treasure having around! Thanks for sharing this….I have dried various flowers over the years…esp hydrangeas. You always give good advice and so glad you live in the Skagit Valley which is one of the most marvelous places on God’s green earth….we moved back to this area after years away and knew we wanted to retire here and now we do…yeah! Would you ever consider selling dried flowers? I’m an artist who makes sculptors out of dried flowers and resin. I’m always in the need for more dried flowers. This is a slightly different use of dried flowers, but I was so excited to see dried flower petals used in weddings rather than rice or bubbles. Flower confetti. So sweet! Those wreaths are beautiful. I have little piles of dried flowers around the house that made me smile all winter long. Nothing at all ugly about dried or preserved flowers! Maybe the photography had something to do with your remembrance of “tacky and dated”. Love Terrain but some would think that their high-priced wreaths are ugly. Glad that dried flowers are coming back in fashion. I work in the floral industry and I have customers ask for dried flowers often. Oh Erin, this wonderful! I fell in love with dried flowers last growing season too. Everything we did not sell fresh got dried in our barn. Hot and dark, it’s the perfect location. We literally dried everything to see how it would turn out by simply hanging it upside down. Some of our favorites were delphinium, ammonium, ruby silk grass and surprisingly dahlias. My absolute favorite though were peonies!!! We now offer complete wedding packages made with all dried flowers. It’s incredible what beauty can be created with them. If you are interested, checkout our Instagram feed and website to see all the beauty we’ve been able to create. http://Www.agilegoatflowerfarm.com We’ve made everything from arch decor, table arrangements, jewelry, bridal bouquets, etc. You name it and it is possible with dried flowers. So nice to see these beauties being promoted! Did you run floral wire up the stems of strawflowers before bunching them to dry? I have read that once dry, the stems are so fragile, they break or crumble. I would appreciate knowing, since it is time consuming, but worth doing in order to preserve the everlasting. This was fascinating! I look forward to seeing more of this reimagined craft! I was with you thinking that dried flowers were totally naff. But like you I have had a rethink as I’m sure they are overdue for a revival. I’m growing from seed and finding that helicrysums and the like are not keen to germinate. I wonder what I’m doing wrong or am I just anther ‘impatient gardener’! I have to admit I also thought of dried flowers as too old & tacky to bother with, but I have started Gomphrena seeds this year and think that will provide the impetus to go at this more seriously. I grew decorative wheat and Nigella last year, and only accidentally found out how long they last and how mixing dried elements with fresh looked really lovely. That wheat was perhaps the easiest thing ever: plunk the seeds in the soil early spring and go on with your life. Harvest and use practically forever. And the Nigella pods are so fun–they have sort of a cool Jetson’s look, like funky little asteroids! I vote yes on expanding this drying idea! I thought I was detecting a return of died flowers, a strong part of my business in the 80’s. I love dried flowers. I especially like making dried flower arrangements so it’s also great to dry eucalyptus (all varieties) to add to the arrangements. Such a timely post! I’ve been loving the beautiful dried flower wreaths and arrangements on IG many Japanese crafters are making and wanted to try my hand at it. What I’ve noticed with these Japanese dried arrangements is that the colors are very vibrant for dried flowers, so not sure if color is being added or if they are using glycerin to preserve color and pliability??? Have been looking for a source to buy these more colorful dried blooms. Looking forward to making some bouquets & wreaths as materials become more available. I have always loved dried flowers. I save flowers and especially little rose buds and baby’s breath. I even managed to save some yellow roses from my mother-in-laws funeral and have made some small wreath arrangements with those that I’ve gifted to the granddaughters. Question: Do you use any drying spray on your flowers? Or what’s your secret to keep them from falling apart? Maybe the secret lies in when you dry them? Hmmm… I’m really gonna enjoy this series and looking forward to learning more. Such a coincidence, last night I was admiring very pretty dried wreaths on the website Terrain. Yes those 80’s images of badly done dried flower arrangements did creep in but there is beauty in dried flowers. If anyone can revive this flower art it will be you. So many new flower types and such talented flower farms and flower artists today make the dried flower arts fresh and new again with their lasting beauty. Have a wonderful, prosperous and creative season. I have always loved dried flowers and grew them in my first garden when newly married. I picked my favorites to grow this year, strawflower, statice, babys breath, globe amaranth, eucalyptus, lavender and sweet annie. I’m glad you are going to be using more of them. Let’s bring them back in new ways! Hi Erin, I am excited to see you embraced dried flowers as a flower production facet. I was disappointed there was not more content on this subject during the online workshop coursework, notebooks, etc. BUT this addition to the blog helps. My years of experience growing for drying has taught me well. Just finished drying a batch of daffodils- people do not realize how easy they are to air dry upright in narrow vases. My new experiments this year will be with the alliums. Last year I had great success with Nandina foliage & seed pods. I think I am moving toward holding workshops. Hope you will continue to focus on dried flowers and carry a line of seeds, bulbs especially suited for drying. Gotta go work with my dried daffodil bunches, so thanks a “bunch”, Prairie Cottage Studio aka Pam Williams in Oklahoma. I have felt the same as you–even the thought of dried flowers brought me back to a time of crinkly, yellowed roses and other dried flowers that truly look terrible. But, like you, I’m coming around… I think the key is only drying things that look great dried! 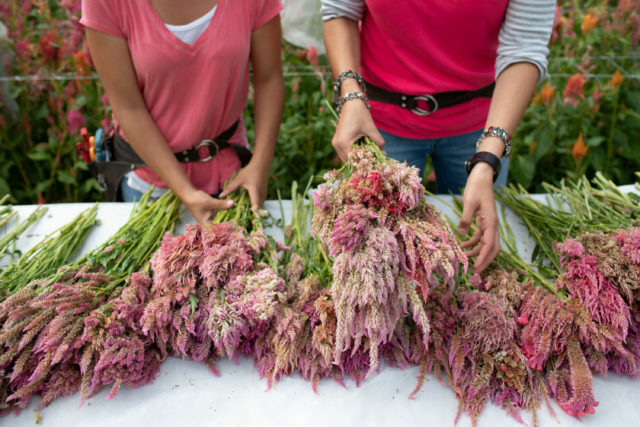 For me, I’ve accidentally discovered good dried flowers because I had them fresh in a vase and they just lasted and lasted–things like statice and globe amaranth–and they look fantastic. You actually can’t tell if they’re fresh or dried. I also like my allium “skeleton” that looks great even after the petals fall off. You’ve totally inspired me with strawflowers–that’s going on my next-year list! I love this!! I have been contemplating dried flowers for weeks because I’d like to hang flowers and ferns from the ceiling of my barn for my wedding. Actually, the bunches drying look amazing and could be used exactly as they are. I also bought floret strawflower, so I’m already on the right track. Thank you!! Thanks for posting this while I am still in the process of choosing and starting seeds to grow. I found the recommended book on Ebay for $ 4.25. I’m real interested in dried flowers. I am unable to focus a lot of my energy on developing into cut flowers and bouquet making, as I am already growing produce/herbs/seedling for our farmers’ market. This will give me something to play with during the off season. For years I have been growing glass gem corn, which is an amazingly beautiful multicolor variety, and harvested in fall. Dried flowers and grasses will be fun to combine with the corn. Let’s see what I can create! I volunteer with Weed Ladies in Naperville, IL, who are celebrating 50 yrs of what started as drying “weeds” from their gardens. We use them for bookmarks/arrangements/fillers/weeaths. Pods/hydrangea/peperonia/baby’s breath. Hope In Bloom is an outreach I started to deliver donated event/funeral flowers to seniors/hospice. I air dry the faded flowers. Dried scraps are used for paper-making. Last Fall, I cut the annual ‘cardinal flower’ vine and shaped/dried immediately to use as a wreath base, then glue on drieds. It’s unique bc the remaining leaves add a lovely texture. Glad to send a picture? Make potpourri. Purple are the most stunning. Lambs ear stays pretty. Don’t be afraid to dry any flower/leaf. They take on a new beauty as they dry. I found it interesting that you mentioned strawflowers and hydrangea. I dried both last year, though I found hydrangea to be a little more persnickety. I enjoyed using them to create ornaments by filling clear glass balls. They made wonderful gifts. I look forward to learning more about what varieties you have success with and maybe some tips for DIY. Cheers. I absolutely love them! I must say, they do bring back vivid memories of the 80’s and early 90’s when everyone was crafting with them…BUT… SO much all together has changed with design and arrangement. I can see that with your friends beautiful dried arrangements. They don’t resemble the 80’s at all! 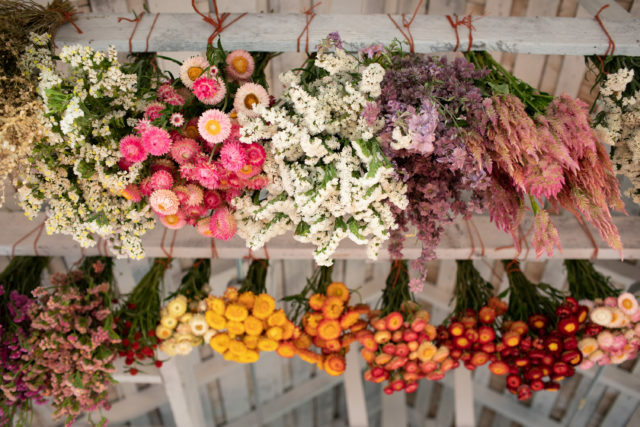 I think it’s time for a Renaissance with dried flowers… certainly fresh flower arranging is also very different than back then, so it would make sense that dry arranging will take on a whole new flair… I also love the kinds of flowers you are drying and the brightness and vividness are beautiful! I’m excited to learn more from you! I adore dried flowers and used to work on a farm that produced a lot of them and I just loved making wreaths. I hope they become popular again. One bit of advice I can share for straw flowers and amobium, cut and bunch them for drying when they bud is clearly showing color but NOT open and exposing any of the center, because they continue to open once hung to dry. The centers on both of these often turn dark or black and look unsightly, in my opinion. One has to consider foliage for wreaths as well. Lambs ear spikes, before the actual flower shows any color, are fabulous. (The pink flowers dry an ugly brown and have to be removed before use, best to cut before they develop.) I also love working with any silver foliage, so lavender, common sage, dusty miller and artemesia are lovely. I truly love dried flowers as much as fresh cut! Great blog post! Thanks! I can´t wait to dig in with dried flowers because they look great in wreaths and want to do those in the fall and christmas season. About how long it takes to dry them? When I thought about dried flowers it took me to a gourd variety I have that we call güira it is like a bottle gourd here its used mainly as an instrument. The man that gave me the seeds he mentioned if I grow them and make sure they stay in a position with bottom flat to soil the grow nicely flat and wide at the bottom…. Which made me think they would do awesome vases for Fall arrangements and workshops… and if we drop in a few dry flowers I think its beyond perfect for fall…I already have a a batch of seeds sprouting to try this idea and see how it goes. Thanks! Question – do you have any issues with mold/rotting when you put dried flowers in fresh bouquets? We love mixing in all sorts of dried pods and bits. It’s a great juxtaposition to the preciousness of cut flowers. A particularly abundant harvest of Coral Fountain amaranthus I grew last year is still hanging around the studio and often gets tucked into our hotel arrangements and photo shoots. Can’t wait to grow a whole rainbow of amaranth this year along with lots of other dryable stems: strawflower, gomphrena, celosia, poppy pods, giant dill, and crespedia. While I’ve largely cut down on my blog reading in the past several years, I don’t miss any of your content. It’s all so inspirational! Would love a guest blog post from your friend or your own ideas on how to use your dried blooms! Gorgeous! I love desiccated flowers, and even murky fresh ones on their way out. Looking up at all of the dried blooms above your head must have been breathtaking. This is helpful. I experimented too, this past year, with dried flowers and found that the straw flowers dry beautifully! The Globe Amaranth also dry well and look lovely in an arrangement with dried eucalyptus. The celosia dry well too. I hung the flowers to be dried in a closet in one of our bedrooms that does not get regular use, it is just a guest room. My disappointment was that the eucalyptus is so crumbly when it dries and it is very hard to work with. I am wondering if anyone knows of a way to avoid that. Maybe I picked them too late, not sure. I much prefer the fresh flowers over the dry, however, the pics of the wreaths in your post are so lovely and we enjoyed our dried eucalyptus/globe amaranth arrangements all winter long. Also, the broom corn is beautiful when dried. I have a generous bunch of those siting in a somewhat tall, tin, slender decorative planter in my foyer and they are just beautiful. They are very easy to handle when dried. I am going to grow more broom corn this year for market and for drying. Last Valentines day my fiance sent me flowers at work that had pink zinnias with yellow centers. It was just last week that I finally threw the vase away with the dried out flowers. The zinnias were still so beautiful even dried. Your post is very timely to inspire me to grow some this spring! I detest fake flowers so I’ve always dried flowers for winter decorating. Yellow yarrow and Annabelle hydrangeas are two of my fav’s but I love seed pods too. I dried flowers the first time around in the 1980s. It was fun then. I moved on to arranging with silk florals but nothing compares to growing and arranging with fresh flowers. I think there will always be room for adding dried elements to a fresh arrangement, but I don’t see a resurgence of the dried flower movement like 35 years ago. As always, I love your post. I have dabbled with dried flowers as a home hobby. They are a different genre altogether, and must be appreciated as such. Maybe others think they are “dull” compared to their fresh siblings in color and form. Not quite, plenty of beautiful dried varieties pack bright saturated color. Depending on how the blooms are dried can affect their form. I agree about storing them. Please keep us updated. So loving your down to earth attitude and willingness to share knowledge. I hope you are blessed with many more years of success. I’m so glad you posted this! My husband and I run a flower preservation business called Wither Without Florals. We started off preserving wedding Florals as way for brides and grooms to enjoy their flowers for decades to come by incorporating their preserved blooms in a unique piece of decor they can hang up in their home. We believe that through preserving flowers, we can also preserve memories, and our goal is for the flower to hold its same color and shape that it did on the wedding day. Recently, we’ve been preserving funeral flowers for families and creating something that can have in their home that honors their loved one who passed. 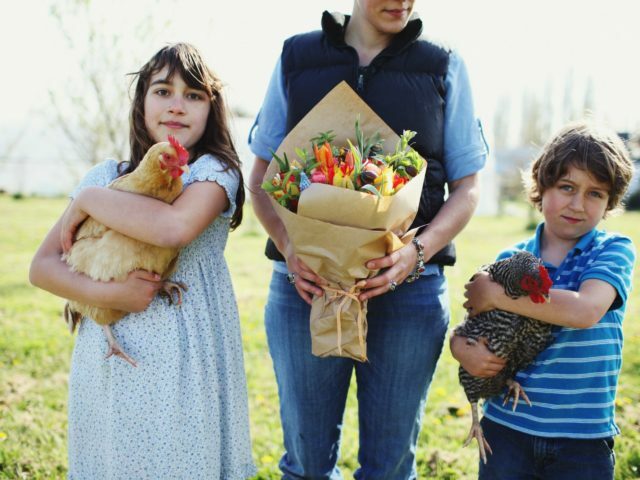 We like to think of ourselves as professional flower rescuers and though it’s a small business, I think it’s meant a lot to the people we’ve gotten to work with so far. Anyways, thanks for the post- it always excites me to see more people working with dried flowers! I’ve always loved dried flowers! We’ve been experimenting with drying just our blooms that we can’t sell (such as stems too short, crooked or broken). We’re going to use them in value-added products like salt scrubs or potpourri for farmers market. I wasn’t going to even consider potpourri because that seems like a trend that died in the 80s but surprisingly, I’ve had several people suggest it so maybe it’s making a comeback….I don’t know. Anyway, I’m excited to try more varieties and methods and explore all the other dried flower opportunities! Your post brought many precious memories my way Erin! Our whole flower career actually started with dried flowers. As it grew, we built a retail shop beside our house and had 2-3 designers hired at all times. We made thousands of wreaths, container arrangements, christmas ornaments, and every imaginable thing you could do with drieds. We dried fruit slices and even some veggie slices in a dehydrator, dried sunflower and double hollyhock heads also in the dehydrator. Our shop was open for 17 years (80’s-90’s) and closed as the trend faded and our Penn State extension agent at the time mentored us into the fresh cut world. We continued to dry whatever was left from fresh sales (cockscomb, silver king artemesia, grasses, hydrangea, etc.) ever since and sell to crafters. I just said to a flower farmer friend this week, “drieds are coming back” and then I saw your post today. Have fun! We are not opening our shop again, lol. Yea! Thanks for pushing into the trend. I chose to dry flowers because I have a no waste farm so flowers that did not make it into the market, I hung to dry. Everything! Most turned out lovely and after making my woodland wreaths, I make two products that folks like at market this spring. Dried bouquets wrapped in white tissue and the flower heads packed into small jars as reminiscent of summer! My first excitement with them was seeing them drying at the Homeless Garden in Santa Cruz. I worked with drying flowers for years. I agree with Mary Menn. And, after all the work, when arranged and used under normal living conditions they soon become dusty and then the pleasure is gone because there is no way to clean the fragile things. And they shed…. I do dry hydrangeas, however – it’s simple and easy and they are fairly sturdy. The variety ‘Strawberry Vanilla’ dries beautifully simply left in a vase, and retains the pink color for at least a year. The blue-green macrophylla varieties are also gorgeous, and easy to dry. I have to say, Erin, I disliked them, too. But now that I see your beautiful pictures, especially the wreaths, I have a renewed sense of gratitude towards flowers for giving so much beauty at all stages!! After all, it is nature, and there are treasures awaiting in the dried realm as well. Maybe you’ll bring them back and it’ll be all the craze again!! Here in Vermont dried flowers, in bunches and wreaths, sell well at the holiday market before Thanksgiving–when there are no fresh flowers in the landscape and people are looking for things to decorate for the winter season and holidays. One note: we have heavy due in the mornings in the late summer and fall, and I find that you sacrifice color, especially in the greens, and the subtle colors of hydrangeas, if you hang them in barn or shed open to the air. I bring everything into the house and hang it inside. Dried flowers are especially needed to extend our very short season in Maine. One year I had a request for a dried flower wedding. I had never done one before but felt challenged and excited to give it a try. It turned out really well and I learned a lot as well. Now I always take time to dry flowers at there peak in the summer to make wreaths and arrangements for the fall market. We successfully dried flowers last year – trying to preserve a harvest that we were unable to sell. It gave us an opportunity to create dried wreaths that became very popular over winter. I tried to convert towards a dying market last summer after the birth of my first baby. I thought it would be something that is more flexible with time than selling fresh cuts. What I found out is that dried are just so much less beautiful and fun to work with. They bored me. I’ll go back to selling dried chinese laterns and money plant bouquets b/c they look stunning and a in high demand but everything else can stay fresh!